Spinal Decompression Dayton, Kettering, Beavercreek, OH Chiropractor - Poelking Chiropractic Wellness & Physical Therapy, Inc.
Over 30 million Americans suffer from back pain every day and a very large portion of them don't have to. An equally large number have been told that this is just a part of getting older. The truth is, It is not! We wake up one day unable to move as freely as the day before. We notice a slight "catch" in our back. Or, we find it hurts to bend over and hug our grandchildren or to lift a bag of groceries. We find ourselves moving slower and making excuses for not playing golf with friends or taking a walk with a loved one. We might have trouble sitting through a movie or a long car ride. Even our sleep is not as peaceful as it used to be. In more severe cases, we may suffer excruciating pain shooting down one or both legs. Perhaps we live with numbness in our arms or legs. We might even need a cane or walker to get around. However it affects us, this is not living like we are supposed to. There are many causes of back pain. Some people are injured playing sports, or in an automobile accident or at work. Most of us however, develop it over a long period of time until the neglect of our spine reaches a critical point. That is when it lets us know the best way it can that it needs help...with pain. Perhaps we were told by our doctor that we have a bulging disc, sciatica or a touch of arthritis and that this is part of normal aging. We were then told our options are to learn to live with it, take pain medicine to get through the day or perhaps take that final irreversible step and seek out a skilled surgeon. There is an alternative that not many understand or know about. Over 65% of patients with back pain will see their primary care physician and be treated symptomatically with pain medicines or injections. Only 17% have sought the NON-INVASIVE,CONSERVATIVE, GENTLE RELIEF of a qualified chiropractic physician who will treat the cause of your back pain, not just the symptoms. At Poelking Chiropractic Wellness & Physical Therapy, we believe you don't have to suffer needlessly with quality of life - limiting back pain. We have built a state–of–the-art practice centered around the patient who is suffering with spinal pain and have been dedicated to relieving it. This is what we do. We are experts at it. And we have helped thousands of patients just like you find lasting relief. What is Spinal Decompression, how does it work and how is it different than traction? Spinal decompression is the process in which a negative pressure from within the disc is achieved while separating 2 vertebrae. This is, however much different than traction! Traction is a sustained "pulling" effect and does nothing to counteract the forces of the body's natural defense mechanism. When a body part is being pulled on, it is only natural for the body to "tighten up" or "guard" that area. That's normal. But through FDA Certified Decompression, it has the ability to read the body's responses up to 17 times per second, to overcome and "trick" the body to reduce the guarding and relax. This can take up to 8-11 mins on average, just to overcome the body's defense mechanism. THEN, decompression begins. The negative pressure forms a "vacuum" where the nucleus (the jelly substance in the center of the disc) is retracted, thus allowing the outer ring of the disc (the annulus) to come together and heal. This allows the disc to heal from the inside out, keeping the pressure off the exiting nerve. Prior to treating, multiple factors are considered including, but not limited to, the level of the bulge/protrusion/herniation, the age and weight of the patient, the presence of other factors (facet arthrosis, ligamentous hypertrophy, spondylosis, stenosis, osteopenia/osteoporosis...) and hydration of the disc. 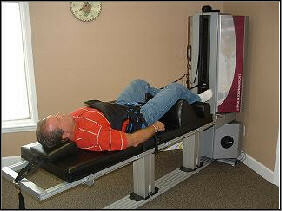 The patient is in the recumbent position with a harness around the waist and one around the upper torso. During the treatment, the patient has a very mild and a precisely computer controlled traction applied along a specific portions of his or her spine. This releases the pressure that gravity has placed on the discs and allows them to begin to regain their normal healthy shape. This "negative" pressure also allows for nutrients to flow back into the disc giving it the ability to better deal with everyday stresses and gravity forces.This allows the disc and back to heal naturally. Additionally, the treatments are gentle, safe, enjoyable and most importantly, conservative. No shots. No knives. Just relief! ​A 68 year old female presents to the office complaining of lower back pain with severe pain radiating down her left leg. She reports this pain started six weeks ago with no known cause and sought relief from her family doctor. He advised her she has a bulging disc putting pressure on the sciatic nerve. He recommended bed rest and treated her pain with prescription pain medicines and muscle relaxants. The patient reported some relief but the medicine made her feel sick. Two weeks later the patient advised her doctor that the pain remained and on some days felt worse. Her physician suggested a course of physical therapy but after her second visit her symptoms worsened. She was told if this doesn't work, surgery might be an option, but she is not sure that this is the right step for her yet. She wants to see if there is anything less risky and non-invasive. After performing a physical exam and reviewing her MRI, the cause of the pain was verified to be a herniated disc protruding into the spinal canal. As an alternative to only masking the pain, I proposed a course of spinal decompression therapy using one of our FDA Cleared Non-Surgical Spinal Decompression tables, joint mobilization, and a targeted course of core strengthening exercises. After a few weeks on the program, there was a marked decrease in the patient's pain and a significant increase in her range of motion. A post treatment MRI showed a significant reduction in the disc protrusion as demonstrate on a subsequent MRI which coincided with the patient's pain relief. The goals for the patient were much more than just "pain relief." The motivating factors in this case were her frustration with her inability to perform normal daily activities such as standing to do dishes and difficulty bending forward to put on her socks and shoes. As this patient's symptoms improved, so did her function and stamina. She was excited about getting back to a normal life and feeling more independent. At this point, I recommended an easy, but effective home spinal strengthening program to support proper pain-free movement and spinal health, This program can be done in her home in just minutes each day. This will allow her to maintain her results without being forever dependent upon us. 86% of patients maintained a 50% or greater reduction in pain. Employment status increased by 40% among those previously out of work due to back pain. The spinal decompression programs offered at Poelking Chiropractic Wellness & Physical Therapy are safe, gentle, pain-free and effective for adults and seniors. This is a conservative therapy working with the body to help it heal itself.